This finding was made in the school when construction workers dug the ground up to 10-foot to lay a foundation of an overhead tank. Burial urns called Mudhumakkal Thazhi have been discovered near Tamil Nadu's Karur district. This finding took place in the premises of Government Elementary School located in Mavadiyan in the Karur municipality limit. The archaeological remains are believed to be over 2,000 years old. This finding was made in the school when construction workers dug the ground up to 10 feet to lay a foundation of an overhead tank. The district administration was informed about the discovery by the headmaster and a team was sent for inspecting the burial urns. Three urns and mortar bricks were found by the team after they carried out a survey. The state archaeology department estimated these items to be at least 2000 years old, though the exact age has to be found by carrying out a detailed examination. 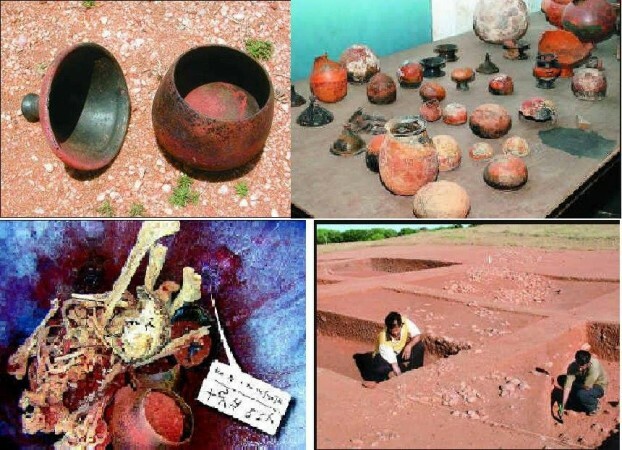 "The history of Mudhumakkal Thazhi is over 3,000 years old and these pots should be at least 2000 years old if we go by the black and brown colour," S Nantha Kumar, curator of Chera Museum of the state archaeology department stated, as quoted by TOI. Kumar explained that as per an ancient Tamil practice, families buried old people in enormous earthen pots created by them, which are referred to as Mudhumakkal Thazhi. "Pieces of bones that have been found with the pots further add value to our theory of it being Mudhumakkal Thazhi," Kumar said. He also revealed that the remains were damaged as the site was disturbed when it was dug by 10 to 12 feet deep for construction. "We are going to send a report to the commissioner of the state archaeology department," Kumar said. Other places where these burial urns have been discovered in Tamil Nadu are Thandikudi in Kodaikanal, Kodumanal in Erode and Aathichanallur near Thoothukudi.